For a limited period, Hilton is offering a £10 Disney Store voucher when booking the Kids Stay and Eat for Free package in the UK. You can find out more on hilton.com here. 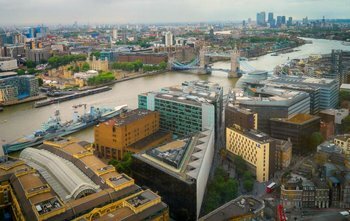 To promote this, Hilton is giving away a stay for two adults and two children at the Hilton London Tower Bridge hotel. The entry form is at the bottom of this page. You need to be a Hilton Honors member to enter but you can sign up during the entry process if you want. I don’t know the closing date but the offer only launched last week. 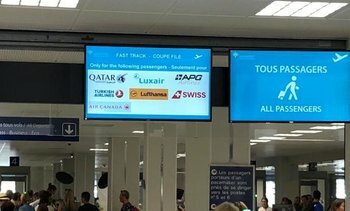 Reader Justin sent me a photo of the Fast Track lane at Nice Terminal 1 which is a relatively new development over the last year or so. As you can see, despite the heavy Club Europe loads on flights to Nice, the signs imply that British Airways has chosen not to pay the airport to let BA passengers use Fast Track. A quick dig around online confirmed that this was the case. Over the last year British Airways has been signing a few lounge access deals in airports where there was a lounge but they had previously refused to pay for it. It would be good if this could be extended to Fast Track security access too. Assuming you tick the box, it brings back the functionality we used to have before GDPR forced us to remove it. Your details should automatically be saved for future comments. Mobile should follow soon. Lloyds starts to close its Duo and Avios Rewards Amex cards - what should you do? O/T just struggling to double check the rukes on Priority Pass – cardholder can get in 1 guest free, right? next one £15. Wife popped over to Rome for 3 nights with our 2 younger kids, just about to encourage her (with an email) to use the PP lounge on the way back, I don’t mind paying £15 for 3 of them, but if it’s going to be £30 they can go to McD’s. She tried to prank me on the airport parking, insisting I both drop her off (early flight today) and pick her up (about midnight in a couple of days). Ie 4 hours+ of my time. Threw quite a strop when I said no bleddy way. Only when I found online parking on decent discount – in her language, I might add – for about £20 did she actually give up the argument. Or 2 of them could get into lounge and give the 3rd one 10 quid to sit outside, I think that would work. Yes only the PP that comes with Amex Plat gives a free guest as well. Regular PP’s you get no free guest. OT I am sure I read the other day that you can no longer refer an Amex card outside of the same family? Was this a temp glitch as it seems possible now? Sorry if this has been discussed already, I couldn’t find anything. Has anyone who self-referred an Amex card not received the points? My card has arrived today but no referral points yet. SR last week, the 18k bonus hit my account day after receiving the card this time. “Mobile should follow soon.” It might just be me but hasn’t mobile had this for some time? I though it weird that it was there on mobile before but not desktop. Either that or my mobile has been saving it whilst desktop refused.. It was there, and then it went for reasons we couldn’t figure. And now it is back! Are all Hilton redemptions cancellable for a full points refund ? Yes, except in exceptional circumstances (World Cup etc) but that would always be made clear.